Well, this one would take quite alot of explaining, so I think I'm better off just showing you my masterpiece: That's right, it's a cow cake. A beautiful cow cake. Why?, you might ask. Well, I'll just say this. My good friend Sarah was leaving the country for a few months, so at our gathering the night before we left, we celebrated/commemorated it with cow cake! No more questions. This is a layer cake with Paula Deen's 1-2-3-4 cake recipe that I've used before, sandwiched together with chocolate frosting. Then I covered the outside with vanilla frosting, and then with rolled out white fondant. Then I had to dye some of the fondant black - boy was that messy. Sure, you can buy black fondant, but where's the fun in that! Anyway then I cut out the shapes and stuck them on with a little bit of water, made the eyes and voila! Cow Cake! You may all now envy my creation. Tip of the Day: When dying fondant (or anything else) dark colors, wearing gloves will prevent your hands from taking on a similar hue. Tip of the day: When eating cakes covered in fondant, remove fondant and just eat cake. Or better yet, just cover your cake in marshmalllow fondant! It's yummy and can be worked with just like regular fondant! I've even had people ask me if there was any fondant left over for them to eat! 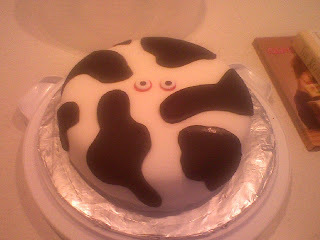 I found your blog from a Cake wrecks comment you left and I have to say, a cow cake with eyes popping on the screen made me giggle.